The Peruvian government has asked MMG to resubmit an environmental plan for its Las Bambas copper mine, in order to include more feedback from local communities. Vice President Martin Vizcarra noted the mine will be allowed to operate as usual while it prepares an “integral” environmental impact study, local paper La República reported. The move is part of the new government’s strategy to rebuild trust on the project following deadly protests from locals, which halted exports from the mine, one of the world’s biggest copper pits, in October. Residents were blocking the roads leading to the mine and clashes left one protester dead and 20 police injured. Authorities had approved the mine’s environmental plan, which called for concentrates to be carried to ports by trucks instead of through a pipeline, as initially proposed. In recent months, residents have been protesting because they said they were not consulted on the revisions to the plan and due to the ongoing noise and high levels of dust caused by hundreds of heavy vehicles that use unpaved roads close to their homes. Las Bambas produced 35,000 metric tons (mt) of the red metal in August, or almost a fifth of Peru’s overall output, official data shows. The operation is set to deliver 400,000 mt of copper per year during the first five years of production. In early November, Hudbay Minerals temporarily suspended operations at its Constancia mine in Peru as a result of locals trespassing on the property and occupying the open-pit area. According to local newspapers, about 1,000 people from the Chamaca district took over the Constancia mine camp and two open pits. After just a few days, the company announced it had resumed operations at the mine following a negotiation, with support from the Peruvian government, of a peaceful resolution of the occupation in the open pit. Prior to the halt of operations, according to Hudbay Peru, Constancia recently signed an agreement with national and local governments and Hudbay Peru confirming areas of social cooperation. Police were present to ensure the safety of people and assets, and Hudbay Peru was working with representatives of the national and local governments, as well as other parties toward a goal of resolving the situation peacefully and safely, the company said. According to local newspapers, the protesters were set up in the mine facilities and planned to stay there until an agreement had been reached with the local authorities. According to one of the protestors, this “invasion” took place because the company had not complied with the agreements of an Institutional Cooperation Agreement signed with the municipality of the Chamaca District in 2013. Shortly after the protest, the company filed an updated technical report for the Constancia mine that included an update of the mine plan. The mine plan incorporates the high-grade Pampacancha satellite deposit and contemplates average annual production of 110,000 mt of copper in concentrate over the next five years (2017-2021) at a weighted average cash cost, net of byproduct credits, of $0.97/lb of copper. Mining at Pampacancha could begin in 2018 with total project capital costs estimated at $54 million. 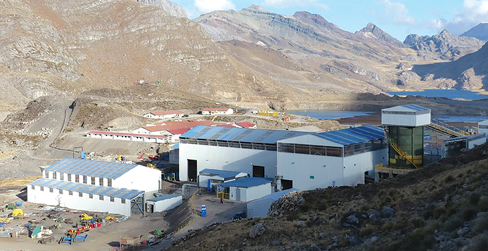 Trevali Mining reported in late October that the ongoing 2016 underground exploration program at its Santander mine in central Peru has discovered a zone of exceptional high-grade zinc-lead-silver mineralization that remains open for expansion. A sub-horizontal drill hole targeting an area between the mine’s Magistral Central and Magistral North zones intercepted 6.95 m (true thickness) of mineralization at 94 m downhole, grading 14.45% zinc, 7.32% lead and 5.42 oz/mt silver. During the third quarter of 2016, the Santander mill processed 216,551 mt of ore at averages head grades of 4.61% zinc, 1.08% lead and 1.26 oz/mt silver. Payable production of metal in concentrate totaled 16.6 million lb of zinc, 4.1 million lb of lead and 192,431 oz of silver. The mill readily operated at its steady-state 2,000-mt/d nameplate capacity, with daily production commonly exceeding this by approximately 15% to 20%. Cash costs were approximately $36.33/mt milled. Santander’s 2016 production guidance remains at 57 million to 60 million lb of payable zinc in concentrate grading approximately 50% zinc; 20 million to 23 million lb of payable lead in concentrate grading 52% to 55% lead; and 800,000 to 1 million oz of payable silver.